2018 was stellar for fintech as the year ended with over 1,700 deals made globally worth nearly $40B. A recent report carried out by CB Insights highlights the current state of financial technology worldwide, and the Fintech industry is healthier than ever. In that sense, the US remained the top market for deals with 659 investments worth $11.89B funding, both a new annual high. A sentiment that was taken outside of core markets (US, UK, and China) as well, as growth on deals in a global scale accounted for 39% of deals. Another important figure that the report pointed out was that there are now 39 VC-backed fintech unicorns worth a combined $147.37B. Data to be at least optimistic about the future of this industry. This report also focuses on 8 global fintech trends we saw in 2018, and they are likely to continue this year, including developments in regtech, money transfer, blockchain, and more. Examples of trends this report explores include unbundling, the rise of impact fintech and increased activity in Southeast Asia. 2018 VC-backed fintech deals and funding set an annual record: In 2018, VC-backed fintech companies raised $39.57B across 1,707 deals globally. Deals were up 15% year-over-year while funding surged 120% on the back of 52 mega-rounds ($100M+) worth $24.88B combined. Early-stage deals, as a percentage, fell to a 5-year low as investors concentrated bets in perceived winners: Global seed and Series A fintech deals grew 5% on an annual basis in 2018, but fell as a percentage of total deals to 57%. US early-stage deals were flat YOY as investors concentrated their bets in established fintech unicorns. 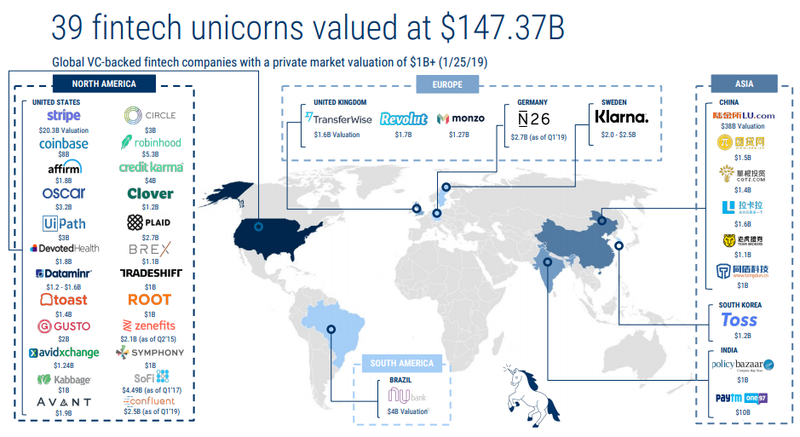 There are 39 VC-backed fintech unicorns worth a combined $147.37B: Q4’18 saw five new unicorns births (Plaid, Brex, Monzo, DevotedHealth, and Toss) and two in the first month of Q1’19 (N26 and Confluent). The cohort’s total valuation in 2018 was boosted by a record year for megarounds to existing unicorns, including Gusto and Robinhood, among others. Fintech mega-rounds continued in Q4’18, while IPO activity is likely to remain lackluster in 2019: 2018 saw a whopping 52 $100M+ financing deals to VC-backed fintech companies – including 14 in Q4’18 worth $3.8B. 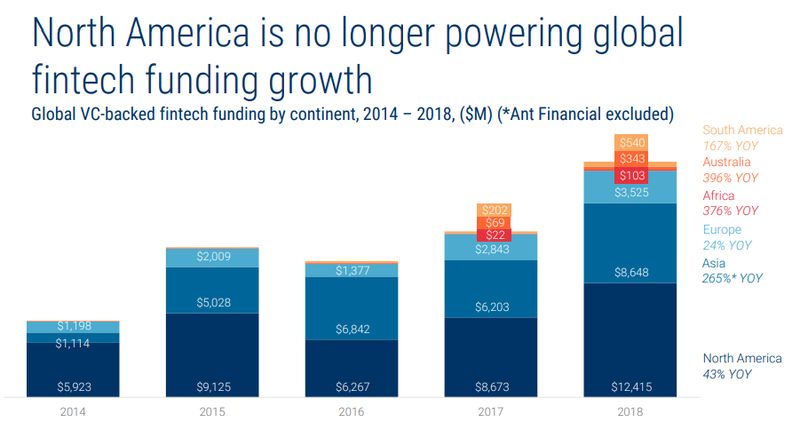 Fintech is happening on global scale with deals outside of core markets (US, UK, and China) accounting for 39% of deals: Fintech deal hubs are starting to emerge globally. The count of unique fintech startups raising funding topped an annual high of 1,463 companies, and the unique number of investors reached 2,745 boosted by an influx of corporate investors. 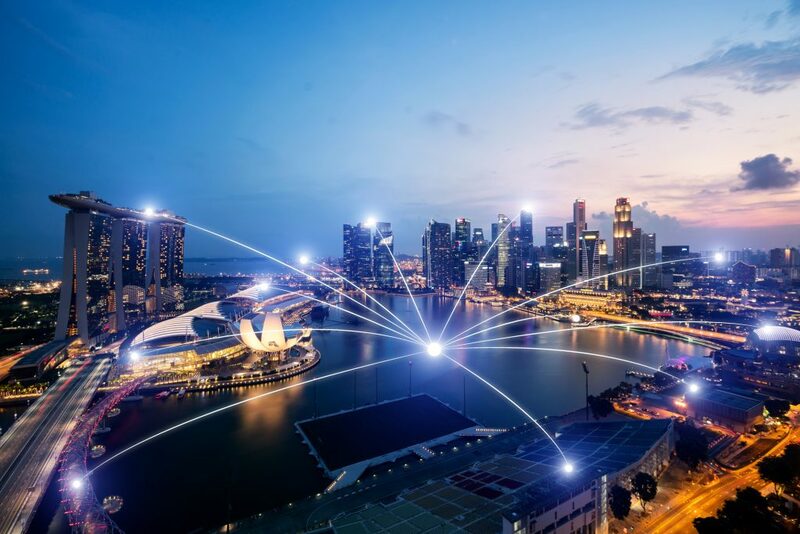 Asia made a run at the US as the top market for fintech with a surge in early-stage and mega-round investments: Asia saw the biggest boost in deals, growing 38% YOY and a record level of funding raising $22.65B across 516 deals. Political and trade war tensions may have caused some of the pull back in H2’18, but 2019 could see Asia overtake the US. The US remained the top market for deals with 659 investments worth $11.89B funding, both a new annual high: Europe saw a pull back in deals to 367 deals but funding topped $3.53B, an annual record. South America reached a turning point in the eyes of investors in 2018, despite political turmoil across the region: South America saw funding top $540M across 55 deals, both a new annual record. In H2’18, investors started to pull back in the region as social, political, and monetary conflicts struck the region. Despite strain, Brazil-based NuBank, became South America’s first unicorn and closed out 2018 with a $90M investment from Tencent.